Café Antardristi is café with a purpose. We serve authentic and homemade products and we’re donating our net profit to project Antardristi. Antardristi is a project run by women to offer support to child survivors of sexual abuse. A purpose worth fighting for. 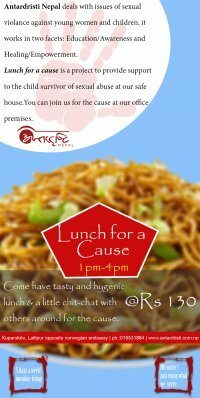 Cafe is located at Jhamsikhel where you can stop by and support us for a cause. This project was started on May 2017. Lunch for a cause is a project to provide support to the child survivor of sexual abuse at our safe house. We provide home made hygenic lunch at our offce premises from 1-4PM for RS.100 every monday - friday. The collected amount will be used for the children's basic needs at our safe house.